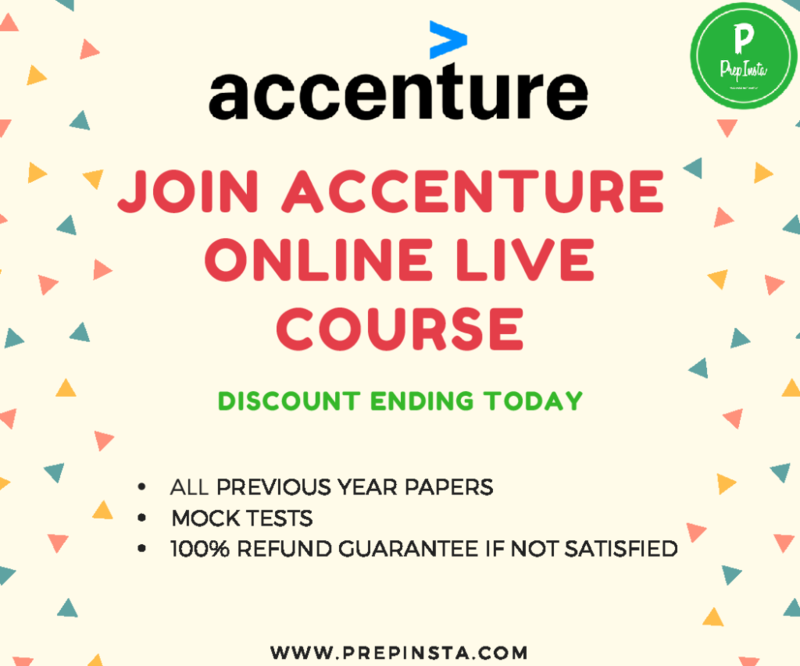 Accenture Aptitude Questions have a little high difficulty but is a little short on time, as analysed constantly from accenture previous year quantitative questions with solutions the paper is lengthy in the online test and the accenture quants questions are adaptive also, i.e. in Accenture quants papers with answers if your previous question was easy and you solved it correctly then next Accenture quantitative aptitude questions in the exam will be tougher and if accenture aptitude questions and Answers PDF last question was tough and you solve that questions incorrectly in Accenture Aptitude Test Papers then, next question will be a little easier. Study for other topics like English, Logical, Attention to detail etc on our Main Accenture Dashboard here. Join the whatsapp Group for Accenture Previous Questions and Preparation here. This section of the test is called applied mathematics. Ques. Where Can I find Previous year Accenture Aptitude Papers and Questions along with Study Material for Preparation? Ans. We have made a complete set of materials for Accenture Quantitative Aptitude Placement Questions and Materials Please visit our Accenture Dashboard for this and study for accenture quantitative aptitude questions. Ques. Accenture Aptitude Questions are they in the Accenture Test Papers with Solutions? Ques. How much time is required for preparation of Accenture Aptitude Test Papers? Ans. We guess around 4 – 5 days must be enough for you to prepare for Accenture Aptitude Test Papers. I applied for Accenture off-campus drive through AMCAT. I registered for AMCAT through www.aspiringminds.com. I started preparing for the written test from previous year papers available on PrepInsta and referred some other competitive books. The eligibility criteria for Accenture is 60% throughout the academic career and no current backlogs. Since I met the eligibility criterion I was shortlisted for the written test. AMCAT paper was divided into three sections Verbal Ability, Quantitative Analysis, and Logical Reasoning. The paper had 75 questions which were to be completed in 95 minutes. There was a sectional cut- off for each section. Verbal ABILITY section had 25 questions, and the time limit for this section was 25 minutes. This section was of medium difficulty level with 4 Reading Comprehensions, passages, and Fill in the blanks. The reading comprehensions were quite long, but they were simple as well. In the Quantitative Analysis section, there were 25 questions. The paper was of medium difficulty level. This section had questions related to basic mathematics such as Permutation and Combination, Profit and loss, Geometry and Time and Work. In the Logical Reasoning section, the questions were conceptual. This section was slightly tricky as compared to the other two sections. The questions were moderate to difficult. There were 25 questions and the time limit for this section was of 35 minutes. There were questions on puzzles, charts, graphs, and tables. The scorecard for AMCAT was issued after a month. I managed to get a good score eligible for the major IT companies. I received an email from Aspiring minds informing that I have been shortlisted for ACCENTURE interview. What do you know about Accenture? Have you done any certifications? How would you be fruitful for us? Are you fine with relocation? The interview went very good. I answered all the questions with confidence. The HR also seemed happy with my performance. After 15 days I received an email from Accenture. It was a congratulations mail that I was selected. I was very happy. I received the joining letter after two months.